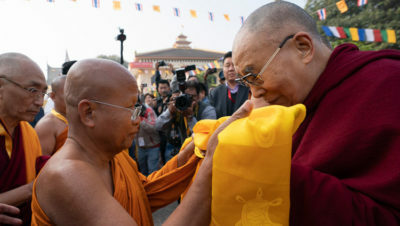 December 22, 2018 Bodhgaya, Bihar, India – The weather was bright and the crowds lining the street were cheerful as His Holiness the Dalai Lama drove the short distance to Watpa Buddhagaya, the Thai Temple complex behind the Mahabodhi Temple. He had been invited to the inauguration of an International Seminar on the Tipitaka / Tripitaka organized by the Buddhist Thai-Bharat Society, the Dalai Lama Trust and the Central Institute of Higher Tibetan Studies (CIHTS), Sarnath. He was welcomed on arrival by the Abbot Dr Phra Bhodhinandhamunee and General Secretary Dr Ratneshwar Chakma who escorted him into the ornately decorated Temple. He paid his respects and lit a lamp before the images of the Buddha. Once His Holiness was seated gifts were presented to him while the Mangala Sutta was recited in Pali. He led a brisk recitation of the ‘Heart Sutra’ in Tibetan. Out in the sun again, His Holiness was requested to take part in the elaborate process of the laying of the foundation stone for a new museum. Inside the hall in which the Seminar was to take place, His Holiness was seated with the abbot and other monks facing an audience of about 500. They included saffron robed monks and lay-people dressed from head to toe in white. In his introductory address, Prof Geshé Ngawang Samten, Vice-Chancellor of the Central Institute of Higher Tibetan Studies, Sarnath, told the audience, “We are here for a two day seminar on the Tripitaka in this most sacred of places for Buddhists, Bodhgaya. It was here that the Buddha attained enlightenment. Shortly afterwards, in his first teaching at Sarnath, he explained the Four Noble Truths, two related to suffering and its origin, and two related to cessation and the path. Geshé Ngawang Samten expressed the view that this seminar focussing on the Vinaya, Sutta and Abhidhamma Pitakas, the Buddhist scriptures comprising the collections of Discipline, Discourses and Higher Knowledge, was important. He observed that at a time when there is growing interest in Buddhist studies across the world, it is significant that those who uphold its traditions should meet and interact with each other. A message from the Supreme Patriarch of Thailand was read by Ven Phra Promwachirayan Prasit Suddhibandhu. He began by acknowledging the venerable monks and invoked blessings on the lay Buddhists participating. He described the seminar as a result of collaboration between the Buddhist Thai-Bharat Society, the Dalai Lama Trust and CIHTS. However, the inspiration for it he attributed to His Holiness the Dalai Lama, who had suggested a meeting without distinguishing Theravada from Mahayana. The Patriarch went on to praise the value of the Tipitaka with its explanation of ethics, concentration and wisdom, yielding understanding of impermanence, suffering and selflessness, the Four Noble Truths and the Eightfold Noble Path. He compared the Buddha to a physician and Dhamma to medicine that can bring hope, happiness and longevity. He asserted that we need to use the defence of Dhamma against weapons of destruction. Likening the Mahayana to a big boat transporting many beings across the sea and Theravada to a small boat transporting beings across a river or canal, he stressed the significance of their working together in mutual support. The goal of Mahayana may be a bodhisattva, while the goal of Theravada is nirvana, but what they have in common is the goal of helping beings, of guiding humanity to the end of suffering. Such an International Seminar, he declared, is important for the preservation of Buddhism and for building faith, love and harmony. He invoked the blessings of the Triple Gem upon His Holiness for the fulfilment of his wishes and his long life. He dedicated the merit to the great kings of the past like Ashoka who supported Buddhism. In his address, the Abbot Dr Phra Bhodhinandhamunee said, “We can all be peaceful and happy in reliance on the Buddha, Dhamma and Sangha. There is no need for fighting, although there seems to be fighting wherever we look. I don’t have anything to say. 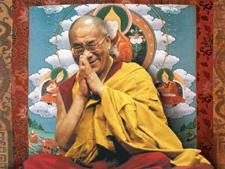 I pay homage to His Holiness the Dalai Lama. I welcome everyone to this temple. 2600 years ago the Buddha appeared and revealed the Dhamma for the benefit of humanity. His Holiness does something similar today with his message of peace and non-violence. His Holiness opened his address with the observation that the Thai monks, who belong to the Pali Tradition, uphold the Theravada Vinaya. In China there is the Dharmagupta Vinaya, while Tibetans maintained the Mulasarvastivadin Vinaya established by the Great Abbot, Shantarakshita. The differences between these traditions are slight. “After his enlightenment, the Buddha ordained monks, who he first told how to wear their robes. Much later, just before he passed away, he told the monks, after I’m gone you can rely on the Pratimoksha Sutra. The foundation of Buddhism is the Vinaya. The Buddhadharma is meant for attaining liberation, to achieve which we need to overcome our disturbing emotions. It entails the three trainings in ethics, concentration and wisdom, of which the most important is wisdom. To really develop wisdom you need concentration and to develop concentration you need ethics. “The Buddhas don’t wash unwholesome deeds away with water, nor do they remove the sufferings of beings with their hands, neither do they transplant their own realization into others. It is through teaching the truth of suchness that they help beings find freedom. 2600 years ago, the Buddha placed responsibility for change on our shoulders. How did he help beings? By sharing his own experience. “The Vinaya is the foundation of the Dharma and part of the general structure of the teachings. We also have specialized teachings, given to specific disciples, like the tantras. The Four Noble Truths are part of the general structure. Highest Yoga Tantra instructions for employing internal energies, chakras and drops were intended for certain specific disciples only. “In Thailand, Laos and Cambodia there is an excellent observance of the Vinaya. We have this practice too, but ours came from the Sanskrit tradition. We study the commentaries of the Indian masters Gunaprabha and Shakyaprabha. The Theravada and Mulasarvastivadin traditions have different numbers of rules, but the difference in practice is small. For example, the Mulasarvastivadin tradition has seven rules about how to wear the robes; the Theravadin tradition has one. Such differences are minor; the spirit and intention are the same. It’s important that we discuss our shared practice of Vinaya, how to keep the rules and how to restore them if they are broken. “The three trainings in ethics, concentration and wisdom we also have in common with non-Buddhist traditions. The difference is in how we approach wisdom. Non-Buddhist traditions in India assert an independently existent self. They also view the absorptions of the form and formless realms as more peaceful than the desire realm. Buddhism, however, teaches selflessness. Among its four schools of philosophy, the Mind Only and Middle Way Schools reject any kind of permanent, independent, single, autonomous self. This is despite it sometimes seeming that there is a self that is the ruler or controller of the five aggregates, the body-mind combination. “The Mind Only and Middle Way Schools assert that things do not exist the way they appear. They teach selflessness not only of persons, but also of phenomena. The Mind Only School speaks of the non-duality of subject and object. They maintain that things have no external existence and arise only because of imprints on the mind. This corresponds to the quantum physics observation that nothing has any objective existence. Through the elimination of karma and destructive emotions there is nirvana. Karma and destructive emotions come from conceptual thoughts. Speaking approvingly of the recently established Thai-Tibetan exchange, His Holiness declared how happy he was to have had the opportunity to contribute to this discussion.